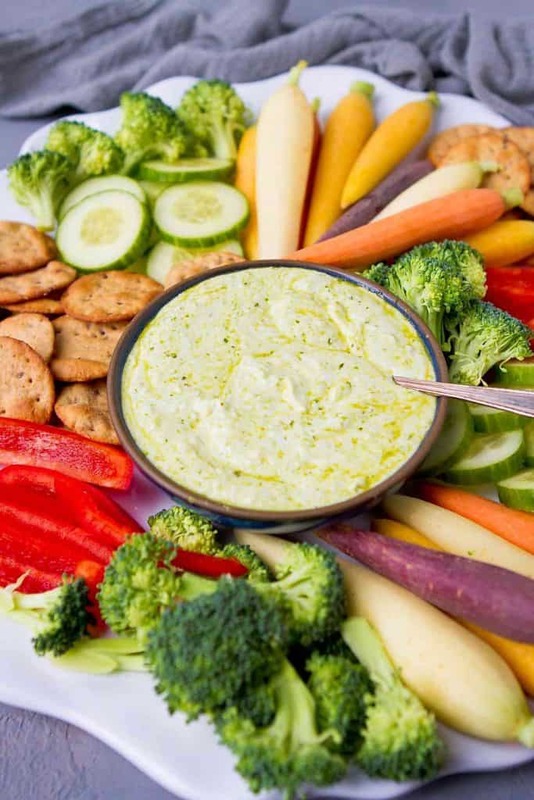 When you’re looking for an easy appetizer or snack, this 3-Ingredient Pesto Yogurt Dip does the trick! Perfect for veggie, sweet potato fry or pita chip dipping. I almost feel guilty about posting this embarrassingly easy 3-Ingredient Pesto Yogurt Dip. Almost. Yes, it’s a recipe that requires only three ingredients. But we all need a simple appetizer idea once in awhile, right? 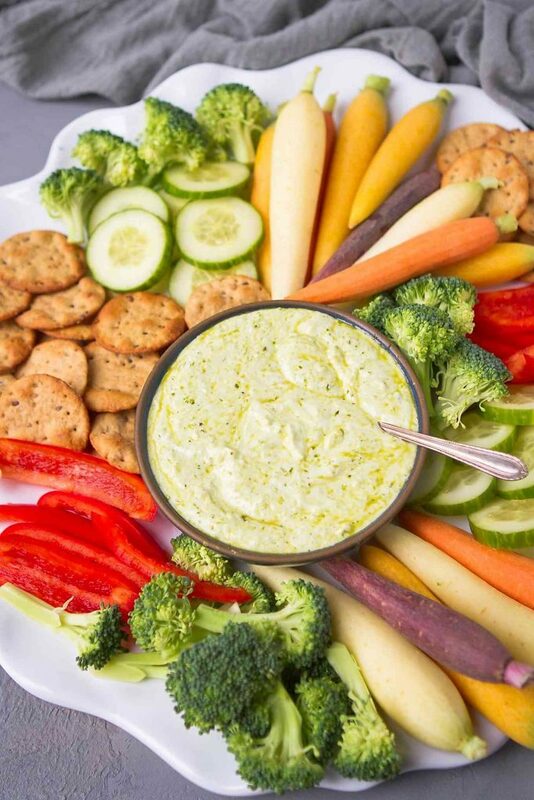 With the Super Bowl right around the corner and the promise of more potluck get-togethers throughout the year, this healthy dip recipe can easily play the starring role on a beautiful veggie platter, complete with pita chips and whole grain crackers. We regularly keep a container of basil pesto in our fridge, and use it to spread on sandwiches or naan pizzas, toss with whole pasta and veggies, or mix with chicken in a stuffed spaghetti squash recipe. 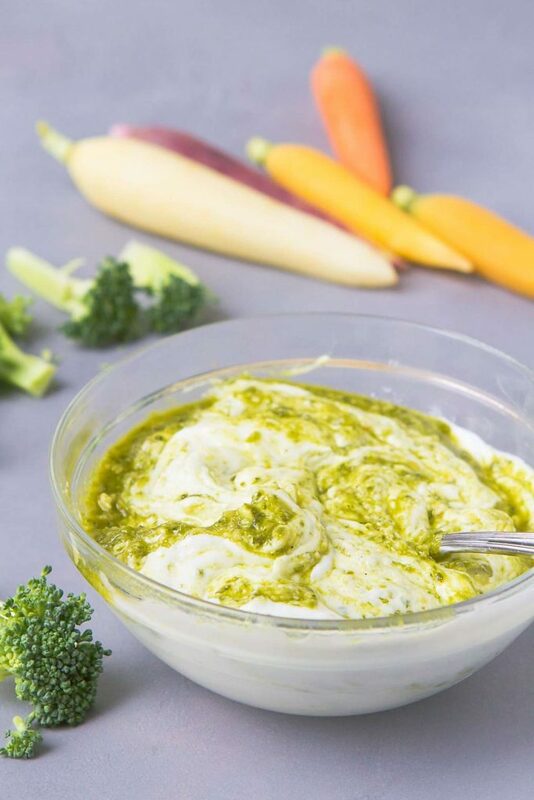 In this easy yogurt dip, use your favorite pesto, whether that’s store-bought or homemade version. Either store-bought or homemade basil pesto can be used. To switch up the flavors, try a different type of pesto, such as artichoke, roasted red pepper or cilantro. Simply stir the pesto into the yogurt and season with a pinch of salt. It’s that easy. Serve this with a variety of raw vegetables, baked sweet potato fries or baked zucchini fries, pita chips or tortilla chips. In a bowl, stir together the yogurt, pesto and salt. Serve with raw vegetables, crackers and/or pita chips. Wow, looks so good! Does this taste good with greek souvlaki meat too? Or is it best for just veggies and crackers? That would definitely work, Mike!